View of a large stone carving at the ancient Maya site of Quirigua located near the banks of the Motagua river in the department of Izabal, Guatemala. 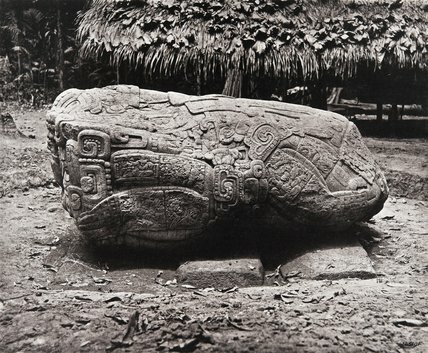 The photograph shows the east side of a carved stone zoomorph known by archaeologists as Zoomorph B, as it was first described by Alfred Maudslay in his seminal publication of the Quirigua site in his multi-volume Archaeology (1889-1902). More recent scholarship dates the zoomorph (also known as Monument 2) to 9.17.10.0.0, 12 Ahau 8 Pax (Maya calendar), or A.D. 780 in the standard Western (Gregorian) calendar. Identified over the years variously as a tiger, dragon, turtle and toad, the carving is now understood by scholars to represent a supernatural crocodilian, sometimes termed the Cosmic Monster. The monument was created during the later part of the sixty-year reign of K'ak' Tiliw Chan Yopaat and marked the close of an era in the Maya calendar. It was one of a number of stelae and zoomorphs erected at Quirigua as part of a complex building programme which took place at the height of the city-state's power during the Late Classic period, and whose primary aim was to legitimate and reinforce the power of the ruler.